Our 5th time at this 14-stage race, and we finished a very solid 3rd place with a team of just 4 people! Very pleased. This is a fundraiser for the Oak Ridges Trail Association - they maintain about 300km of trails in the Moraine area surrounding Toronto. From the start we were in 3rd, keeping good contact with the boats we knew we had to stay with. But then we rounded the corner, and straight into a headwind. The waves were coming right across the lake, almost 8km, and wow did they build up some steam. The boat was bouncing all over the place, several times waves broke over the front. If I am being totally honest - it was terrifying! We kept our cool as best we could and kept paddling. Two teams were pulling away a bit, when suddenly one flipped. We paddled up to them, all had life vests and said they had to wait for the power boats to help - so we continued on our way, now totally freaked out! Our boat had taken on a fair bit of water, and when we listed to either side it would slosh and almost pitch us over - very bad mojo. I had to stop paddling and bail, there was just no choice... we lost a bit of time, but better than going over. Meanwhile the boat in 1st place went over to the shore and got out entirely. We figured we were leading! Good lord! Except they were just dumping water, soon they were back in and ahead. A few boats caught up to us from behind at this point, with all the bailing and freaking out we were doing, but the water started to calm a little as we got further along. Settled into a rhythm and things got better. We weren't able to close the gap to 1st but we put a good chunk of time into everyone else - in the end we finished 2nd by about 5 minutes. Felt amazing to overcome all of that and put in a result! Our cyclist did a great job to catch the team that had finished the canoe ahead of us - only to be pipped at the very end by the team that had flipped! They had some crazy amazing mountain bike kid. Fortunately they weren't ready for the run, so we started Stage 3 with a bit of a lead. My teammates did these runs valiantly, but this is where we tend to start losing touch with the top 2 teams, and this year was no exception... they have some gazelles. Solid results from our guys, right on expectations. From this point on, we were in 3rd. Solidly. Nobody catching us from behind, nobody we could catch in front, as long as we avoided disaster our day was pretty much cast. I was back for my first run on a stage I have never done before. On the map this one looks like a bunch of straight roads with a few trails. In reality there is a lot of trail, and it is not all that straight! It was more challenging than I had expected, plus a few pretty healthy hills for good measure. There is one really pretty section, too, where you run along a bubbling creek for a few kilometers - very nice. Two bike stages, our guys nailed both. My stage - this is a bike I have done before, it is almost all roads - mostly gravel, some pavement to start. Then at the end there is a loose rock and sand section that is almost unrideable, just to keep you on your toes. The big challenge was the wind... it was out of the Northwest, and I was going north and west! Really had to dig deep on this one. Nice run through Durham Forest, our guy was like clockwork again, bang on our estimates. My stage. I don`t know why I always take this one... I think it`s because it is so awful I feel bad giving it to anyone else - there`s only one year I let someone else feel the pain. It starts out on road, then onto a nicely groomed trail. But as you go further and further west, the nicely groomed trail turns into a weedy trail, and by the end you`re running on mushy muddy swampy nastiness... it`s a trail in name only at that point! I did OK, but with 4 stages in me I was starting to really fatigue. Finished as strong as I could and my day was done. The guys did great jobs on the remaining stages, closing out our race. We weren't really racing anyone by this point, which wasn't as much fun as some previous years when we were neck-and-neck with other teams... but that`s just how things go sometimes. Other than a very quick fix on a flat tire, everything went great and on target. Another year in the books! Lots of absolutely amazing volunteers and some great competitors out there, this race is just full of positive people. I love it, and it is a great organization to help support. Congratulations! 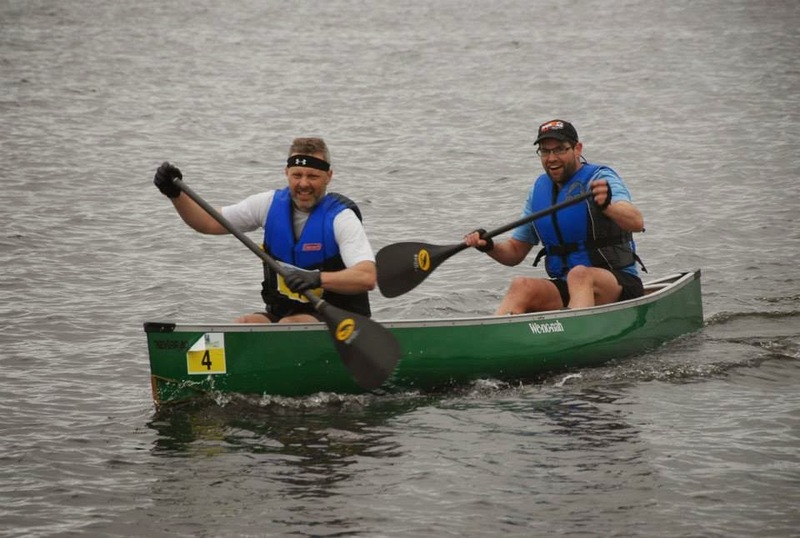 You and your buddy need to give yourselves more kudos for your canoe skills. Sounds scary but still an awesome finish. Thanks for having me on your team Jon, it was a hoot. I agree the canoe was the stage performance of the day.